We aren’t born knowing how to handle conflict. It’s not something we grow into either, like learning to walk or talk. If you have more than one young child in your home, you probably have days where you feel like Moses in the wilderness. Each day, people would line up from morning to evening, asking him to arbitrate each person’s disagreement or complaint. If we have to stop and pass judgment for every little disagreement our children have, it’s not only taking up our time and wearing us out, it’s passing up important opportunities to teach our children. Our children need us to teach and model godly ways of interacting with one another. How can we do that? 1. We can start with our own example. Our failures are actually prime teaching opportunities to model biblical conflict resolution and repentance for our children. When I speak harshly or accidentally hurt one of my children, I need to apologize. If my wife and I get into a disagreement in the presence of our children (at the meal table, for example), then we should resolve the problem in their presence, in the appropriate way, if possible. We may think it will lower their esteem for us and our position if we admit to making mistakes, but just the opposite happens. Their respect for us will increase when they see us humble ourselves, admit our mistakes, and ask forgiveness. They will learn from the example we set for them. In many conflicts, young children really don’t know the right thing to do. We need to teach them God’s standards for loving one another and for resolving conflicts. Read them Matthew 18 or study Doorposts’ Brother-Offended Checklist. Some offenses can just be overlooked or forgiven on the spot. Others can be resolved by the offender and the offended person alone. Some require help from us as parents. Often the offense was not one-sided and both parties need to admit sin and ask forgiveness. To learn godly ways of dealing with conflict, our children need lots of practice. They need us to teach them what kind of words and actions are appropriate for different situations. We periodically have to remind our children to “use your words.” When they get upset, they feel like yelling, grabbing, crying, or calling for mom. The instinct is not to stop, think, or talk to the other person. But we can teach them this. They can learn to use their words to communicate what upset them, politely ask a sibling to stop bothering them, or ask for a toy instead of taking it. Our goal is to help them learn to treat others like they themselves would want to be treated. 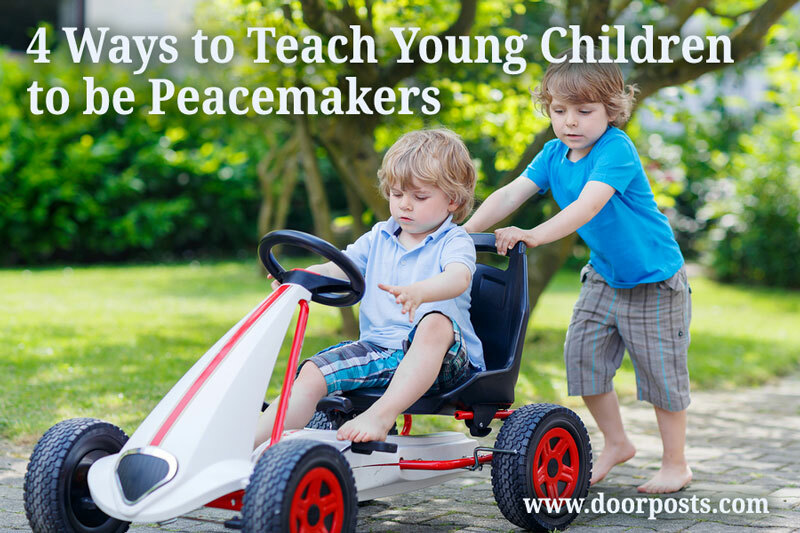 Of course, our children will never be perfect peacemakers. Not by God’s standards. Neither will we. We’re all sinners who need Jesus. Contentious behavior reveals a selfish heart, and which is more important—raising children who follow all the rules and never make trouble—or raising children who see their sin and their need for Jesus? It’s tempting to focus on behavior but not the heart. It’s possible to raise children who don’t cause us trouble but don’t know how to work through conflicts biblically. It’s possible to raise children who know how to avoid conflict but don’t understand their own hearts. It’s possible to raise children who get along with others but don’t think they need Jesus. We’re responsible not to merely teach peacemaking skills or mete out justice, but to help our children see and understand their hearts. None of us can be peacemakers (or obey God in any other way) in our own power. We need to know Jesus’ love. We need Him to change our hearts before we can truly love others. Even when our children are young, we can help them understand their heart, pray for God to help them love others, and help them come to know Jesus, the Prince of Peace. My husband and I are so grateful for your wise words. God is leading you to lead others to Him. He is so good! We are very much looking forward to the promised piece from your mother about how to train older children to obey. Thanks, Amy. She’s still working on the next post in the obedience series. It’s coming soon!